Among the mix of local wildlife is an unassuming creature that once roamed with the dinosaurs 70 million years ago. Hard to believe, but the lowly opossum, most commonly encountered as road kill along county roads, is an enigmatic and remarkable animal. Knowing their habits and history helps promote a peaceful, mutually beneficial coexistence with these humble and sometimes misunderstood “first citizens” of wildlife. According to licensed wildlife rehabilitator Birgit Sommer at the Rainbow Wildlife Rescue in Stephenville TX, these furry foragers are actually one-of-a-kind wonders. Opossums are the only marsupials in the entire United States, a cousin of the kangaroo and koala. They have more teeth than any other land mammal (50-plus). Opossums also have a robust immune system virtually impervious to the venom of rattlesnakes, vipers, cottonmouth snakes, and spiders. 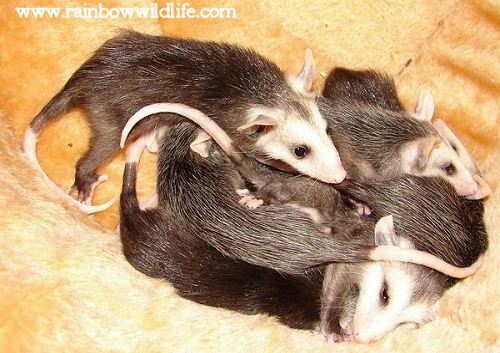 A litter of orphaned opossums being cared for at the Rainbow Wildlife Rescue in Texas. Their extremely low body temperature of 94 to 97 degrees F is an inhospitable environment for survival of the rabies virus and other common wildlife diseases. In fact, said Ms. Sommer, there have been only 5 confirmed cases of a rabies infected opossum in Texas since 1962. Solitary and nocturnal (active at night), the opossum has a brief life span for their size (2 to 4 years). If encountered unexpectedly, they can appear very intimidating with their sharp teeth exposed, growling and hissing with the appearance of an oversized rat, but, in reality, they are not aggressive and prefer to be left alone. However, they will defend themselves when cornered and may bite. Sometimes, when frightened or trapped, they may fall into an involuntary shock-like state for up to 4 hours (“playing possum”). Always give the benefit of the doubt when approaching an apparently dead opossum. These unique creatures are at home in trees. Opossums use their prehensile tail to help stabilize their position when climbing. (Contrary to common belief, they do not hang by their tails.) Their omnivorous diet includes snakes, insects, snails, rodents, carrion, eggs, corn, berries, over-ripe fruit, grasses, leaves, and other vegetables. They do not actively hunt and are not predatory. If you do not wish to have these useful critters around, bring pet food and water indoors at night, close all doors and windows (including pet doors), and tightly secure garbage cans. Pick up fruit that has fallen from trees, and clear dense woodpiles, weeds, and other possible hiding places. Opossums have many predators such as people (with cars), along with dogs, cats, owls, and other wildlife. It is popular with some people to joke about dead 'possums on the highway but in some cases many other unseen lives are at stake. If you see an apparently dead opossum on the road and it is safe to pull over, move the body to the side of the road and (if a female) check the pouch for any live young. She may be carrying up to 13 babies, or “joey.” Make sure you wear gloves or use a rag or towel for protection. If there are babies present, carefully extract them from the pouch and place them into a box or bucket lined with cloth. The infants cannot survive long outside the pouch environment. A word of caution: if the apparently dead opossum is not dead but injured, please use extreme caution. Injured animals are already frightened; approaching them will have self-defense as an automatic response and you could get bitten or scratched. The worst dangers to the orphans are chilling and dehydration. The best way to warm up an opossum baby is to wrap them in cloth and hold them against your body. Alternatively, you can using a disposable plastic bottle filled with warm water. Wrap the bottle in an old t-shirt and place it inside a box or plastic container with the baby. Make sure that it will not roll around, possibly hurting the animal. Do not use a towel or else there is a danger of the threads getting caught around toes or tails. T-shirts, sweat shirts, or blankets cut into small squares work great. If the babies are well furred, you may try to give them fluids to keep them hydrated before you transfer them to the nearest wildlife rehabilitator. Pedialyte or clear Gatorade will work. Dilute either with distilled water 1 part to 2 parts, warm it to body temperature, and offer it slowly with a dropper. Even small infants have the ability to lap. Be careful that the baby does not inhale the fluid. Just one drop of liquid entering the lungs can mean a protracted death for the baby. Baby opossums usually do not suckle. Never under any circumstances feed cow’s milk to an opossum baby. Almost all baby animals are incapable of digesting the lactose and any die due to digestive problems. Because opossums are wild animals, they do not make 'cool' pets. All wild animals belong in the wild, so it is advisable to give the opossum the chance to live the life nature intended. It is illegal in most states to be in possession of a wild animal without the proper permits. 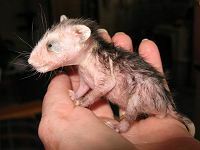 If you come across an orphaned or injured opossum or other wild animal, contact your local wildlife rescue center or visit www.rainbowwildlife.com.